On this day in 1920, one of the most famous and influential examples of German Expressionism was released, Robert Wiene’s silent horror film The Cabinet of Dr. Caligari. One of the first films to use a frame story narrative, The Cabinet of Dr Caligariis told as a flashback with protagonist Francis telling the story of his hometown of Holstenwall, a German mountain town when it is visited by the mysterious Dr Caligari, who displays a hypnotically controlled somnambulist named Cesare at the local carnival. When mysterious things begin happening in the town, Francis discovers that in 1703 a mythical murderous monk named Caligari visited towns in Northern Italy with his own somnambulist companion whom he controlled and used to commit a string of murders, and at the same time discovers that Dr Caligari is the doctor of the local insane asylum. As the story unfolds the fate of the local residents is discovered and the true identity of Dr Caligari is finally revealed. 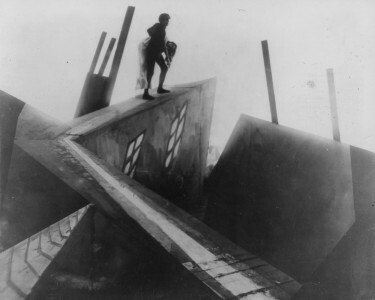 As well as being revered as one of the most quintessential examples of German Expressionism, The Cabinet of Dr Caligari has become a classic film, frequently screened as part of introduction to film and film history courses, and is also widely regarded as being one of the first horror films, and is said to have introduced the “twist ending” style of storytelling. The film has in recent years been digitally restored and the restored feature premiered in February 2014 at 64th Berlin International Film Festival. If you love your classic horror make sure to bookmark us as we’ll have some great horror related posts coming your way over the weekend!